The HOn3 Branchline TieClip connector is used to join any HOn3 Branchline QuickStick or TwistTie flexible or fixed strips to any other HOn3 Branchline QuickStick or TwistTie flexible or fixed strip. They can also be used to connect QuickSticks or TwistTie strips to switches (turnouts, wyes, etc.) 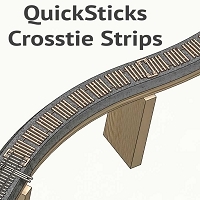 built using Fast Tracks Assembly Fixtures and QuickSticks.